CLOX is an easy to use app that gives you clocks showing the time in user-selected time zones. The new version 8 signals a radical departure from the look of the previous versions. You can instantly customize and skin the display to your taste, choosing from no less than 15 built-in display styles, set the language the size and type of clocks, and other elements. Local time and UTC (GMT) can optionally be displayed along with the date overlaid on a world daylight map, with up to ten user selected time zones shown on analog and digital clocks. All the settings are remembered automagically, no need to save any changes. 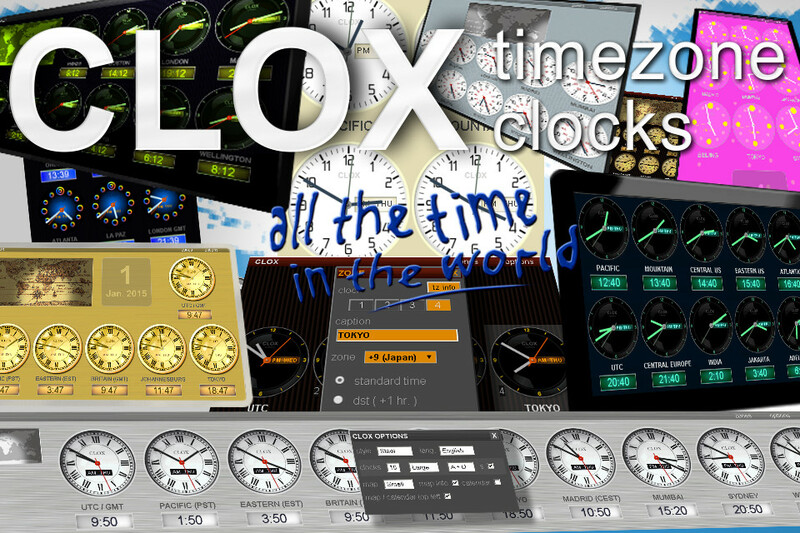 The integrated news feed, timezone and daylight saving time reference database provide a convenient way to help ensure that your timezone clocks are kept showing the correct times.CLOX 8 is wonderfully simple, pleasurable and fairly intuitive to use. A detailed user guide is supplied but you\'ll probably figure most things out without needing to give it more than a glance. Email and web support is free if you have a question. If you\'ve family, friends or do business across different time zones then CLOX is a fantastic, solid, great-looking timekeeping tool that\'s available for both desktop and mobile. If you\'re ever short of time don\'t worry, with CLOX you will literally have all the time in the world! Magnifying Glass is a high quality magnification software that emlploys advanced image filtering algorithms. It allows displaying magnified portions of the screens that are smooth and sharp which results in increased readability. A small drive desktop-bar. Every 2 Minuten the program will be initialized. New (Net) drives will automaticly added to the MiniBar. You can see max 15 Drives on the CFMiniBar. You can adjust whether the MiniBar will be minimize.